And the (PBWA) winners are…. Posted on March 27, 2012 | Comments Off on And the (PBWA) winners are…. When All-Star weekend in Orlando came to an end last month, a quality event was lost amid all the chatter about the slam dunk debacle and the game that didn’t get interesting until the waning minutes: the annual Professional Basketball Writers Association awards. 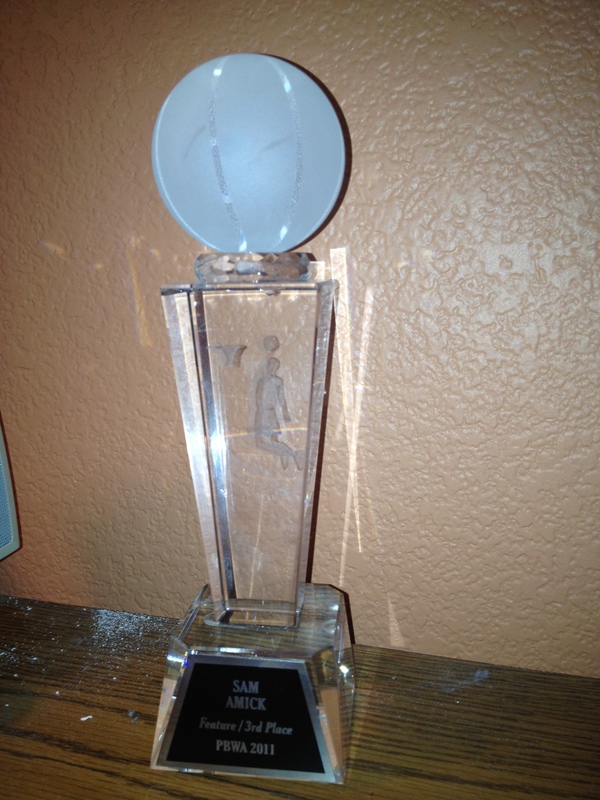 The tireless and talented NBA scribes who cover this game for a living get together at All Stars every year to hand out the hardware, and I was certainly honored to be among those having this fancy trophy sent to his house. Yet while the work was acknowledged privately, I decided belatedly that it’d be worth taking a moment here to acknowledge it publicly. Do yourself a favor and read all of these pieces, then follow all of the writers on Twitter (links on names) since these stories are hardly aberrations. There are three categories (Game story, Column, Feature) and three places (with one unique exception that is explained below). Thanks to PBWA president Doug Smith, VP Steve Aschburner, and Treasurer Rich Dubroff for all you do as well. Comments Off on And the (PBWA) winners are….